Anti-government forces in Eastern Ukraine have announced a recruitment campaign, to start next week. Kiev said the move indicates heavy losses suffered by their opponents. The expected recruiting drive, which mirrors Kiev’s own mobilization order by President Petro Poroshenko last month, will be officially launched next week, Aleksandr Zakharchenko, the head of the self-proclaimed Donetsk People’s Republic, told a local news station. “As for mobilization, conscription, we are capable of doing it,” he said, adding that the troops would be involved in a counteroffensive against Kiev forces. “We plan to form five new brigades, three of them mechanized. We have the basis to train the soldiers. I believe we can do it by springtime,” he added. The official later clarified that they plan to recruit more volunteers, rather than to enforce conscription, and that the training may take as long as six months. Reports from on the ground indicate that logistic structures of the rebels are only partially functional, and that conducting a full-blown conscription campaign amid ongoing hostilities may be too complex. Enrolling and training “up to 100,000 soldiers,” as declared initially by Zakharchenko, is clearly an impossible goal in the war-torn region that saw hundreds of thousands of people fleeing in the past several months. Kiev officials cheered the news, saying it indicated impending doom for the militias. “We are still checking it, but it indicates that they are short of fighters,” Kiev military spokesman Andrey Lysenko told at a daily briefing. Ukraine’s own mobilization campaign, the fourth since the armed coup in Kiev brought to power the current government in February 2014, is reportedly stalled because potential recruits are dodging conscription officials. Hundreds of Ukrainian men are choosing to flee the country rather than be enrolled. The violence between government troops and anti-government militias escalated in January. 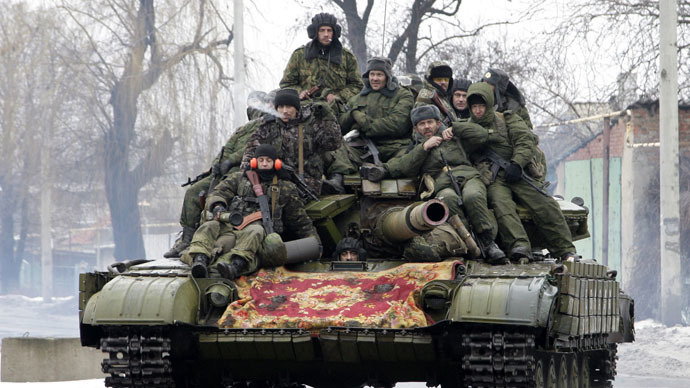 The rebels fended off what Kiev described as a “massive offensive” and scored several territorial gains. The heads of the People’s Republics of Donetsk and Lugansk have issued a joint statement, in which they blamed Kiev for the failure of the latest round of peace talks on Saturday. “The negotiations in Minsk turned out fruitless and were thwarted solely due to the fault of the Ukrainian side,” said the leaders of the republics, Aleksandr Zakharchenko (DPR) and Igor Plotnitsky (LPR). At the same time, Kiev has blamed the rebels for sabotaging the talks, as they were unable to send officials with a high enough rank to Minsk in order to sign a new agreement. Ukraine was backed by the OSCE, which stressed that the DPR and LPR representatives, Denis Pushilin and Vladislav Deynego, in the Belarusian capital “weren’t even prepared to discuss the implementation of a ceasefire and withdrawal of heavy weapons." “It’s Kiev, which isn’t ready to talk. It’s Poroshenko, who rushes back and forth and is afraid to take responsibility,” they said. The DPR and LPR heads once again turned down Kiev’s offer to bring back the disengagement line agreed by the sides in September last year. “Why would we do that? To see our cities shelled again? To see more defenseless people, women, elderly and children killed? No, gentlemen, forget about it. You’re suffering yet another military defeat right now,” they said addressing the Ukrainian leadership. Both Zakharchenko and Plotnitsky stressed they want a peaceful solution to the conflict and are ready to resume talks with the other side. “We don’t need blood. We’re ready to stop, but only at the line where we are now. We won’t betray the memory of our brothers-in-arms and peaceful civilians, who died in January…we demand Kiev return to the table and start negotiating,” they said. The focus of the current hostilities is the area around the city of Debaltsevo, a stronghold of Ukrainian troops deep inside the rebel-held part of the country. Some 8,000 troops stationed in the area are at risk of being cut off from supply lines and suffering a major defeat. Moscow is skeptical about the prospect of a new ceasefire, blaming Washington for not pressuring Kiev into seeking peace rather than continuing the war. “Elsewhere in the world, our Western partners are calling for dialogue between the authorities and the opposition. Everywhere in Yemen, Iraq, Afghanistan, South Sudan. But Ukraine is for some reason an exception. Western colleagues say that in Ukraine the most important thing is to support Kiev’s actions,” Russian Foreign Minister Sergey Lavrov told a media conference in China. Russian president Vladimir Putin expressed his concern over the situation in Donbass and called on both sides involved in the conflict to stop the war, the president’s press secretary, Dmitry Peskov, told TASS. The civil war in eastern Ukraine has claimed more than 5,000 civilian lives, according to the latest UN count.